The existence of the quartzite outcrop known as the Rock is undoubtedly responsible for the initial settlement and location of Kilcoole. Early peoples arriving in Ireland after the last ice age would have been drawn to the Rock, from which one could spot approaching boats and erect defences. Food would have been abundant in the birds and fish of the marsh and coastal area, just a mile away. Besides its usefulness, the Rock must have also been an impressive landmark that represented the status and pride of the people living there. The area between the road (now Main Street) and the Rock served as a Fair Ground and Green up until the late 1800’s. The name “Lower Green” is preserved in street signs, but nearly all the open space has been lost to housing since the early 1900s. One can imagine what would have been a majestic view from Main Street across the green to the Rock, and from thence the sea. The Rock itself is preserved, though the steepness of its slopes have been somewhat reduced by infill of the surrounding area. A field below the Rock remains in a wild state. Views from the Rock are magnificent, taking in the coastal lowlands from Wicklow up to Bray Head. The map of 1908 shows a footpath passing north of the Rock that existed until recent times. Pedestrian access today is from Main Street along two narrow lanes, and from Lott Lane by a steep pedestrian footpath running between houses. There is no Local Fair held in Kilcool now but where the Cottages now stand (built about 25 years ago) was the Fair Field. There was a big trade carried on and fairlings[?] of every description sold to young and old…. It must be close on 50 years since a Fair was held here. There was a large pond beside the Fair Field and in Winter when it was frozen the boys used to skate on it. It is filled in long ago and a Cottage and garden belonging to Mr. Jack Greene [built] there. This section was contributed by Koen Verbruggen, Director of Geological Survey of Ireland, native and resident of Kilcoole. Kilcoole is underlain by some of the oldest rocks in Ireland and the village owes its existence to the local geology. The rocks are sandstones of a type called quartzite, made up of tiny quartz rich sand grains fused together to form a very hardwearing rock. This is best exposed at the Kilcoole “Rock” in the Lower Green area of the village. Here the quartzite forms a prominent outcrop with a steep 40-foot drop on the east side and this hill can be seen clearly from the coast over a mile away. The grey quartzite is crossed by ribs of white quartz veins, of even harder and purer quartz. The sediment would originally have been laid down at the bottom of a deep ocean, called the Iapetus Ocean, that covered most of the centre of what is now Ireland, with coasts and land to the south east and north west. These rocks belong to what geologists call “the Bray Group” and are similar to that occurring on the nearby hills of Bray Head, and both the Great and Little Sugarloaf. These rocks contain Oldhamia radiata, a trace fossil, i.e. a sedimentary structure resulting from the biological activity of an ancient organism. 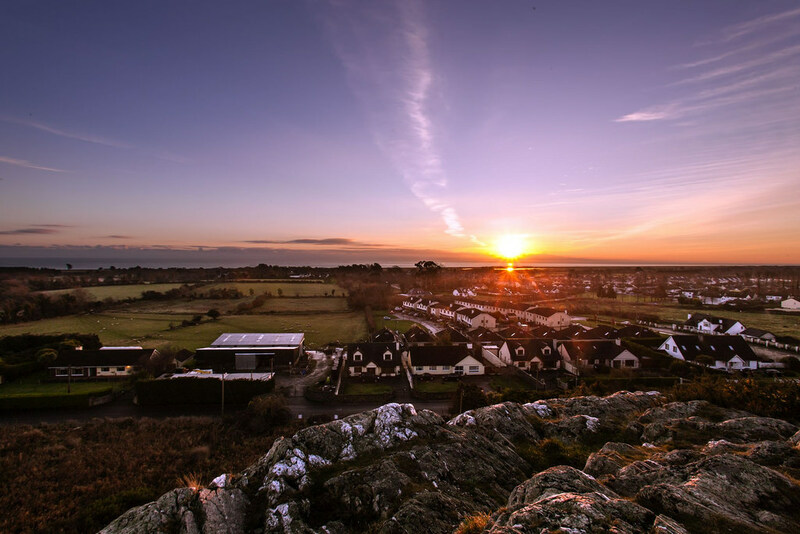 The fossils were first discovered on Bray Head by Thomas Oldham, the former Director of the Geological Survey of Ireland in the 1800’s, after whom they were named. Based on this fossil evidence and subsequent radiometric dating, the rocks are known to be over 500 Million years old, belonging to the Cambrian Era. In fact Bray Head was once the world’s top attraction for geologists and fossil hunters, with the discovery of Oldhamia, at the time the worlds oldest ever fossil, believed to represent the “Origin of Life”.